WE ARE STYLE MAKERS AND DETAIL-ORIENTED PERFECTIONISTS, INSPIRED BY THE WORLD AROUND US, NEAR AND FAR. DEVELOPING A MEANINGFUL DESIGN REQUIRES CAREFUL RESEARCH OF THE LOCATION,PROPERTY, AND UNIQUE STORY OF A SPACE. IT IS THAT SPECIAL CONSIDERATION THAT SETS PARADIGM APART. 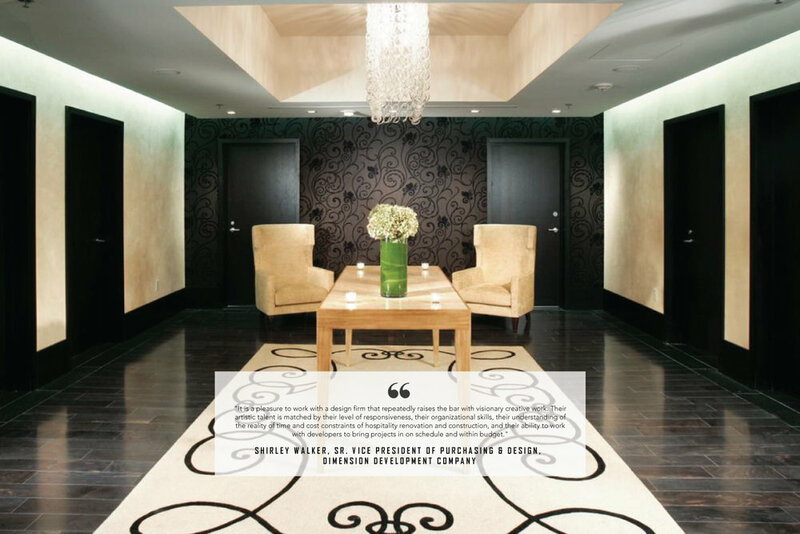 Paradigm Design Group offers our clients a team of professionals that simply love design. Every project is different, and we embrace those differences. Our enthusiasm is unleashed as we develop tailored concepts and build a unique presentation (engaging environments), partnering with you through the design and development process. Paradigm Design Group is the ideal partner to transform your investment from average to amazing. Lisa A. Haude is a well-respected interior designer who specializes in hospitality design, with a reputation for creating a masterful story in the work she and her group undertake. As head of her own firm for the last fifteen years, Lisa has enjoyed working with most of the major hotel brands all over the world to create one of a kind designs tailor made for their specific setting. “Every project is a new adventure, and we treat it as just that, with in depth research, story boards, and concept development, much like if we were writing a book. Each step leads us to the next step in a managed but openly creative approach. No idea is disregarded. We use the synergy of our different backgrounds, preferences, and things we’ve seen, to create something different every time.” Lisa has served as the President of Paradigm Design Group for the last fifteen years, but prior to starting her own firm, was affiliated with Deborah Lloyd Forest Associates, Bristol Hotels & Resorts, and Mitchell Carlson Stone, Inc. She holds a Bachelor of Science degree in Interior Design from Baylor University, and has served as Editorial Advisory of the NEWH Magazine, as well as various consultative roles for leading hospitality resources. Lisa and her business partner and husband Carl live in Geneva, just west of Chicago, with their daughter Isabella. Between work and family life, the Haude’s enjoy relaxing at home or traveling all over the world. What room would we most likely find you in when you’re at home? In the kitchen! I love to cook and have to maintain a strict gluten-free/dairy-free diet in our household. I’m learning that I can create some fabulous things that taste yummy with just a little creativity. I get that question a lot! It’s a German name, but is pronounced “Howdy”. I tend to fall in love with all of our projects, especially those that we’ve put so much energy into. But, there is a special place in my heart for The Roosevelt, which is the Waldorf in New Orleans. It had been closed since Katrina and we worked very closely with the ownership group and the people of New Orleans to bring it back to life. It was like restoring an old masterpiece. It’s a classic, timeless design and I’m really proud and honored that we were selected to be part of the renovation team. Coldplay, Imagine Dragons, Bon Jovi. Carl H. Haude, Jr. serves as Paradigm Design Group’s Chief Financial Officer and has over 15 years of experience in business administration, information management, and international business. Carl and his wife Lisa founded Paradigm Design Group in 2001, and partnered to bring together a creative and detail oriented design process with a keen business focus to develop a business model that minimizes costs, maximizes creativity, and always focuses on the client. Carl focuses his attention on the technical efficiencies and financial structures of the firm, a key element in ensuring data integrity and reliability which is the cornerstone of the documentation process. In addition to his work at Paradigm, Carl manages a real estate development enterprise. Prior to his work with Paradigm Design Group, Carl worked with Duke Energy International where his team managed $2 billion in electricity generating assets in South America. He is fluent in Spanish and conversational in French. He holds a Bachelor of Science degree in Modern Foreign Languages from Baylor University, and a Master of International Business degree from the University of St. Thomas. Carl, Lisa, and their daughter Isabella live in Geneva, just west of Chicago. How do you handle being the only male at Paradigm? Very carefully! Seriously though, these ladies are all very talented and our environment is family oriented. I’ve been impressed over the years to see how we’ve thrived without a lot of drama. The team is focused on projects and schedules, leaving no room for ego. Your role at Paradigm is focused on financial and technical results, a relatively serious arena. Is that the type of career you thought you would have? Well, to be fair, my professional life has encompassed many different arenas, and I’m continuing to grow and watch for those types of opportunities. To answer your question though, as a kid, I wanted to be an airplane pilot. What is your ideal way to get away after a stressful day? I enjoy sitting in my library for a little peace and quiet. There may be a small bowl of M&Ms by my side if it was a particularly rough day. Do you have a favorite music genre? We are style makers and detail-oriented perfectionists, inspired by the world around us, near and far. Developing a meaningful design requires careful research of the location, property, and unique story of a space. It is that special consideration that sets Paradigm apart. Paradigm’s design team is equipped to provide the distinctive look you want and deserve. We constantly think of fresh ideas but have the experience to know what does not work in the real world. Technology is our friend, and we invest in those efficiencies so we can focus on your design. Whether it is a web based meeting, or a digital version of plans, we save you both time and money by staying up with the best tools of the trade. Working with the best in the industry is an honor, and we have been privileged to work with a long list of respected developers and owners, as well as most of the major hotel brands. Before your construction documents are submitted, they are thoroughly reviewed in a three part process, including the Principal, Project Manager, and Project Designer. Accuracy is key. Paradigm Design Group has enjoyed productive relationship with most of the major hotel brands including Hilton, Marriott, Starwood and Hyatt Hotels.